In their Treatment Guidelines for Attention Deficit Hyperactivity Disorder (1), the American Academy of Pediatrics clearly states that a care plan for children with this condition should include behavioral treatment along with any prescribed medication. For some children with mild to moderate symptoms behavioral treatment may prove sufficient to improve or alleviate symptoms. Also, some research studies indicate that the use of behavioral treatment along with medication may reduce the dose of medication necessary for effective treatment. Data from a major national study conducted by NIMH known as the Mutlimodal Treatment Study of ADHD (MTA) shows that 33% of children with ADHD were “normalized” [exhibited test scores within the normal range for ADHD and ODD (oppositional defiant disorder)] as a result of receiving behavioral treatment only without any medication while 68% were normalized as a result of medication combined with psychological treatment as compared to only 56% of those treated with medication only. 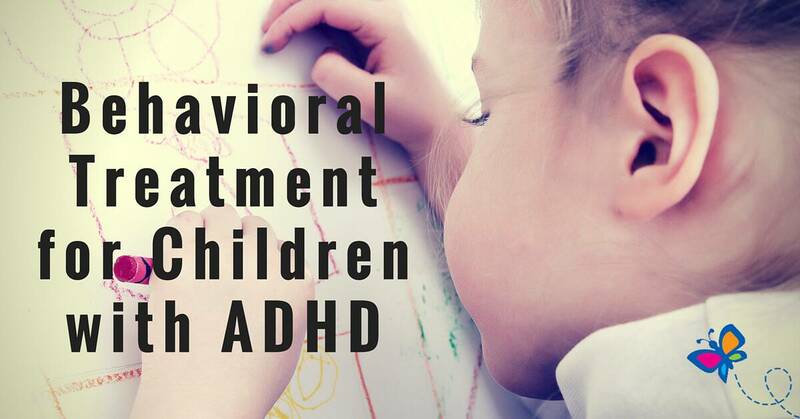 Thus, roughly one third of children diagnosed with ADHD may achieve normal behavior from a comprehensive program consisting of treatment strategies similar to those used in Total Focus. Also, there is about a 20% increase in the number of children normalized by combining medication with psychological treatment. Finally, after 2 years 97% of those in the psychological treatment only group remained normalized as compared to only 66% for the medication only group. According to a study conducted at State University of New York at Buffalo, “combining behavior modification therapy with medication is the most effective way to improve the behavior of many ADHD children. In fact, when the two are combined, the study showed, the amount of medication required to achieve the same results as use of medication alone can be reduced by two-thirds”. Making appropriate educational materials easily available may prove to be difficult for a busy practice. Referral to a mental health professional may be hindered by the cost of the care or the time and commitment involved and also the ability to connect the patient and family with a qualified mental health professional who specializes in the treatment of ADHD. Therefore, a program like Total Focus can provide an efficient means to make this valuable help easily, readily and economically available to those who can benefit from it. One major finding of the MTA Study conducted by the National Institute of Mental Health (2) was that the children of parents who developed a disciplined yet positive approach to parenting were able to maintain treatment gains during the 14 month period of the study. One of the primary goals of the parent education module of Total Focus is to enable parents to adopt a parenting style that will work not only for the ADHD child but also for the entire family. When parents implement the major components of the program, they end up developing a family culture that is healthy and supportive to the entire family and therefore likely to endure for many years if not become a permanent fixture in their daily lives. During the course of coaching their child through the various modules such as problem solving and relaxation training both the parent and the child develop valuable coping skills. This along with implementing “The Special 20” technique also builds the type of positive bond between parent and child that has been found through research to result in the development of a teenager and young adult who is capable of successfully navigating the dangerous shoals encountered at school and in the community. Some of the psychological interventions such as problem solving training and social skills training included in Total Focus have not always been recommended as part of a treatment plan for a child with ADHD due to research based on the use of these techniques in a group setting. However, newer research indicates that when these techniques are implemented through a parent/child collaborative approach to learning they can be very effective. Descriptions of the various techniques discussed below were provided by National Institute of Mental Health and include all of the recommended psychological interventions provided in Attention Deficit Hyperactivity Disorder 2006 (rev) NIH Publication No. 3572 (3) Evidence from scientific research studies indicating the usefulness for each component in Total Focus is provided below along with a description of how each component provides the recommended treatment. PARENT SKILLS TRAINING, offered by therapists or in special classes, gives parents tools and techniques for managing their child’s behavior. One such technique is the use of token or point systems for immediately rewarding good behavior or work. Another is the use of “time-out” or isolation to a chair or bedroom when the child becomes too unruly or out of control. During time-outs, the child is removed from the agitating situation and sits alone quietly for a short time to calm down. Parents may also be taught to give the child “quality time” each day, in which they share a pleasurable or relaxing activity. During this time together, the parent looks for opportunities to notice and point out what the child does well, and praise his or her strengths and abilities.This system of rewards and penalties can be an effective way to modify a child’s behavior. The parents (or teacher) identify a few desirable behaviors that they want to encourage in the child—such as asking for a toy instead of grabbing it, or completing a simple task. The child is told exactly what is expected in order to earn the reward. The child receives the reward when he performs the desired behavior and a mild penalty when he doesn’t. A reward can be small, perhaps a token that can be exchanged for special privileges, but it should be something the child wants and is eager to earn. The penalty might be removal of a token or a brief time-out. Make an effort to find your child being good. The goal, over time, is to help children learn to control their own behavior and to choose the more desired behavior. The technique works well with all children, although children with ADHD may need more frequent rewards. In addition, parents may learn to structure situations in ways that will?allow their child to succeed. This may include allowing only one or two?playmates at a time, so that their child doesn’t get over-stimulated. Or?if their child has trouble completing tasks, they may learn to help the?child divide a large task into small steps, then praise the child as?each step is completed. Regardless of the specific technique parents may?use to modify their child’s behavior, some general principles appear to?be useful for most children with ADHD. These include providing more?frequent and immediate feedback (including rewards and punishment),?setting up more structure in advance of potential problem situations,?and providing greater supervision and encouragement to children with?ADHD in relatively unrewarding or tedious situations. Parents may also learn to use stress management methods, such as?meditation, relaxation techniques, and exercise, to increase their own?tolerance for frustration so that they can respond more calmly to their ?child’s behavior. Evidence: The MTA Study (2) concluded that “long-term combination treatments and the medication-management alone were superior to intensive behavioral treatment and routine community treatment. And in some areas—anxiety, academic performance, oppositionality, parent-child relations, and social skills—the combined treatment was usually superior. Another advantage of combined treatment was that children could be successfully treated with lower doses of medicine, compared with the medication-only group”. Most professionals agree that this intervention should be available to all parents of kids with ADHD. Total Focus: Audio and workbook lessons provide parents with the tools the need to successfully manage their child’s behavior and home and in the community. The home/school behavioral program reinforces appropriate behavior and achievement at school. The audio lessons expand a parent’s time as they can listen and learn while driving to work or around town. The bonus lesson, “ADHD: First Aid for Parents” provides proven techniques that are easy to implement to handle a wide range of behavior problems. They include: The First Time Club – The “I’m Bored” College – The High Sign Technique – Catch Them Being Good – The Saturday Box – Grandma’s Rule – Time Out the Toy. The use of family meetings and encouraging parents to spend time each day having a fun time with their children promotes a climate of acceptance, support and cohesion that will produce healthy development in children whether they have ADHD or not. PSYCHOTHERAPYworks to help people with ADHD to like and accept themselves despite their disorder. It does not address the symptoms or underlying causes of the disorder. In psychotherapy, patients talk with the therapist about upsetting thoughts and feelings, explore self-defeating patterns of behavior, and learn alternative ways to handle their emotions. As they talk, the therapist tries to help them understand how they can change or better cope with their disorder. Total Focus: Audio lessons combined with workbook material use Cognitive Behavioral Therapy to boost self-esteem and motivation. Techniques include the use of positive affirmations that apply to specific situations. Acronyms like HOME for developing coping skills around the home, IDEA to teach problem solving and phrases like “Stop the Stinking Thinking – Start Smart Talking” provide verbal intermediaries so necessary for these kids to remember and apply all that they learn through participation in the program. child understand his or her feelings and actions, it helps directly in changing their thinking and coping and thus may lead to changes in behavior. The support might be practical assistance, like help in organizing tasks or schoolwork or dealing with emotionally charged events. Or the support might be in self-monitoring one’s own behavior and giving self-praise or rewards for acting in a desired way such as controlling anger or thinking before acting. Total Focus: Audio and workbook lessons teach problem solving techniques for use at home and school. The lessons also help children to develop a positive attitude about themselves and those around them. SOCIAL SKILLS TRAININGcan also help children learn new behaviors. In social skills training, the therapist discusses and models appropriate behaviors important in developing and maintaining social relationships, like waiting for a turn, sharing toys, asking for help, or responding to teasing, then gives children a chance to practice. For example, a child might learn to “read” other people’s facial expression and tone of voice in order to respond appropriately. Social skills training helps the child to develop better ways to play and work with other children. Total Focus: An audio lesson using FRIEND as an acronym teaches basic social skill concepts. The workbook provides materials that teaches appropriate skills for specific social situations and includes a “Feeling Faces” chart to teach recognition of emotions in others. Parents are given specific instructions on how to implement the module. RELAXATION TRAININGTeaching children with attention deficit disorder how to relax can be effective in reducing hyperactivity and disruptive behavior while increasing attention span and task completion. The purpose of biofeedback is to enhance an individual’s awareness of physical reactions to physical, emotional, or psychological stress, and their ability to influence their own physiological responses. The overall purpose is to develop self-regulation skills that play a role in improving health and well-being. Total Focus: Audio lesions combining relaxation training with guided imagery and positive suggestions are used to apply relaxation training to a variety of situations likely to be encountered by a child in the home and at school. Additional audio and workbook lessons teach general relaxation that can also be applied to help improve attention, concentration and frustration tolerance. Children are taught to use a deep breathing and a “secret word” to quickly relax when they start to feel “uptight.” Audio and workbook exercises are also provided to help parents cope with stress and develop a positive parenting attitude. A temperature biofeedback card is included to facilitate the relaxation training sessions to help achieve maximum benefit. Total Focus: The workbook provides a series of cognitive rehab exercises in the form of simple tasks and games designed to improve attention, concentration, memory and executive functioning through repetitive practice. Parents are directed to games and play activities that reinforce the skills as well as to online resources for a wide variety of computer programs to improve these functions. Recognizing the need for a methodology to increase access to evidence-based psychological treatment for children, Child Development Institute has produced a multi-media program known as Total Focus that involves the parents and children working together as a team to help the child achieve success at school and enjoy life at home and in the community. The program is based on 20 years of clinical experience of Child Psychologist, Dr Bob Myers and is produced by a leading publisher of parenting programs. Dr Bob also shares additional insights from his own experience successfully raising a son with ADHD which parents find both comforting and encouraging. Total Focus is cost effective (less than a three month supply of medication or one visit to a mental health specialist). It is an evidenced-based program using methods supported in the medical and scientific literature. Total Focus is based on behavioral treatment strategies recommended by the National Institute of Mental Health. Complete, easy to follow instructions are provided along with numerous questionnaires, charts and handouts for implementing behavior change programs and monitoring progress. Even telephone coaching by mental health professionals trained by the author of the program is available when desired. The program can be used instead of medication for children with mild to moderate symptoms or as adjunctive therapy for those taking stimulant medication. The program not only provides parent education and behavior modification but provides psychological interventions that (1) teach coping skills, (2) improve motivation and self-esteem and (3) may address mild to moderate manifestations of possible comorbidity including anxiety, depression and ODD. Please see a review of Total Focus by ADHD researcher and clinical expert, Stephen Hinshaw, PhD. Asbahr FR, Castillo AR, Ito LM, Latorre MR, Moreira MN, Lotufo-Neto F. Group cognitive-behavioral therapy versus sertraline for the treatment of children and adolescents with obsessive-compulsive disorder. J Am Acad Child Adolesc Psychiatry. 2005 Nov; 44 (11):1128-36. Bussing R, Zima BT, Belin TR. Variations in ADHD treatment among special education students. J Am Acad Child Adolesc Psychiatry. 1998 Sep;37(9):968-76. Compton SN, March JS, Brent D, Albano AM 5th, Weersing R, Curry J. Cognitive-behavioral psychotherapy for anxiety and depressive disorders in children and adolescents: an evidence-based medicine review. J Am Acad Child Adolesc Psychiatry. 2004 Aug;43(8):930-59. Conners CK, Epstein JN, March JS, Angold A, Wells KC, Klaric J, Swanson JM et al Multimodal treatment of ADHD in the MTA: an alternative outcome analysis. J Am Acad Child Adolesc Psychiatry. 2001 Feb;40(2):159-67. Cousins LS, Weiss G. Parent training and social skills training for children with attention-deficit hyperactivity disorder: how can they be combined for greater effectiveness? Can J Psychiatry. 1993 Aug;38(6):449-57. Review. Donney VK, Poppen R. Teaching parents to conduct behavioral relaxation training with their hyperactive children. J Behav Ther Exp Psychiatry. 1989 Dec;20(4):319-25. Frankel F, Myatt R, Cantwell DP, Feinberg DT Parent-assisted transfer of children’s social skills training: effects on children with and without attention-deficit hyperactivity disorder. J Am Acad Child Adolesc Psychiatry. 1997 Aug;36(8):1056-64. Goldbeck L, Schmid K. Effectiveness of autogenic relaxation training on children and adolescents with behavioral and emotional problems. J Am Acad Child Adolesc Psychiatry. 2003 Sep;42(9):1046-54. Hampstead WJ. The effects of EMG assisted relaxation training with hyperkinetic children: a behavioral alternative. Biofeedback Self Regul. 1979 Jun;4(2):113-25. Hinshaw SP, Henker B, Whalen CK. Self-control in hyperactive boys in anger-inducing situations: effects of cognitive-behavioral training and of methylphenidate. J Abnorm Child Psychol. 1984 Mar;12(1):55-77. Klingberg T, Fernell E, Olesen PJ, Johnson M, Gustafsson P, Dahlstrom K, Gillberg CG, Forssberg H, Westerberg H. Computerized training of working memory in children with ADHD–a randomized, controlled trial. J Am Acad Child Adolesc Psychiatry. 2005 Feb;44(2):177-86. Pavuluri MN, Graczyk PA, Henry DB, Carbray JA, Heidenreich J, Miklowitz DJ. Child- and family-focused cognitive-behavioral therapy for pediatric bipolar disorder: development and preliminary results. J Am Acad Child Adolesc Psychiatry. 2004 May;43(5):528-37. Rapport MD, Loo S, Isaacs P, Goya S, Denney C, Scanlan S. Methylphenidate and attentional training. Comparative effects on behavior and neurocognitive performance in twin girls with attention deficit hyperactivity disorder. Behav Modif. 1996 Oct;20(4):428-30. Raymer R, Poppen R. Behavioral relaxation training with hyperactive children. J Behav Ther Exp Psychiatry. 1985 Dec;16(4):309-16. Richter NC. The efficacy of relaxation training with children. J Abnorm Child Psychol. 1984 Jun;12(2):319-44.